Associated Builders and Contractors of Iowa (ABC), a national construction industry trade association representing more than 21,000 members, congratulated Kinzler Construction Services for recently being named a GOLD Safety, Training, and Evaluation Process (S.T.E.P.) award recipient at their Excellence in Construction Gala. Every year, the ABC honors contractors who have achieved the highest level of safety in their firms. 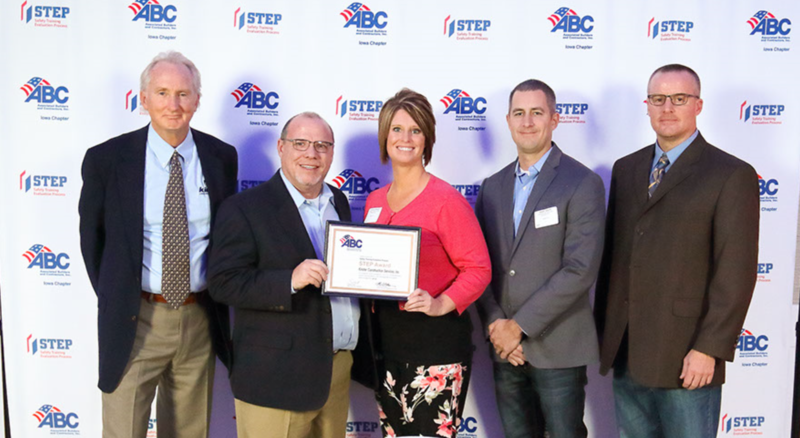 ABC uses the STEP application and interviews with company safety directors and owners to determine who receives the award. Contractors receiving this award typically possess exemplary total recordable rates and lost workday injury-illness rates. Kinzler Construction Services is proud to be a repeat recipient of the prestigious STEP award. Located in Ames, Ankeny, Cedar Rapids and Waterloo, IA as well as Fridley, MN, Tyler, TX, and Denver, CO, Kinzler Construction Services is an employee-owned construction subcontractor with a proven process for hassle-free installation and delivery of building materials.